Just a note that the Whooping Cranes are in Alabama. They will be flying from Walker county to Chilton County during the morning on December 3rd, 2010. If you happen to be in central Alabama notice the sky. I suggested getting up and going to see them take off but my children nixed that idea. 🙁 They are so boring. They would rather sleep. Being somewhere an hour away by 6:45 AM wasn’t their idea of fun. We have a small pond and we often have blue herons that fly over or land at our pond. One year we actually had one living at the pond for a few weeks. This might be an interesting activity for your children to watch. 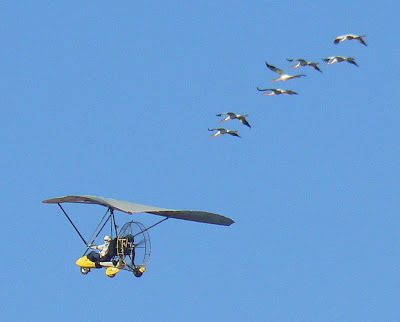 Can you believe that they lead young whooping cranes by an ultralight to new nesting grounds for the winter?